How to get there: There are several ways to start out. In order to be concrete, assume you arrive in Milan. Take autostrada A-1 south-east. After passing Parma and Reggio you arrive in Modena. Locate Hwy. S-12, heading south towards Lucca and Pisa. Take this road and drive south until you locate the small village named Pievepelago in the bottom of a valley. 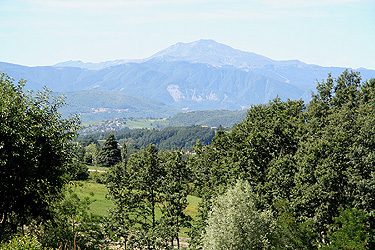 Continue another 3-4 kilometer (In the direction of Abetone), then fork left and drive into the small, charming village of Fiumalbo. Drive across the bridge and then a second bridge to the center of town, there is a small tunnel uphill, but quite close to your location. Measure from here. Drive through the short tunnel and continue uphill. At kilometer 0.5, hold right in order to continue uphill on the right road. At kilometer 2.5, again keep right and continue uphill. At kilometer 4.3, you arrive at a large parking area. This is the trailhead, location N44:11.463, E010:40.371, elevation about 1365 meter. Route description: This description covers a circular trip traversing the summit. Obviously, one can do the hike in the reverse order or just use the route of ascent (or that of descent). We headed uphill on the large parking lot (slightly left) and continued along the small dirt road that heads uphill and eventually meets the hiking route number 487 coming up from the west. Continue to follow the road uphill as it first traverses south, then turns and crosses the north-west ridge at location N44:11.951, E010:41.212, elevation 1811 meter. From here, head straight up the grassy ridge. You will see some cairns leading upwards and eventually the trail becomes more visible. Higher up, you hit the trail that ascends from the opposite (east) side. This trail leads directly up to the summit. 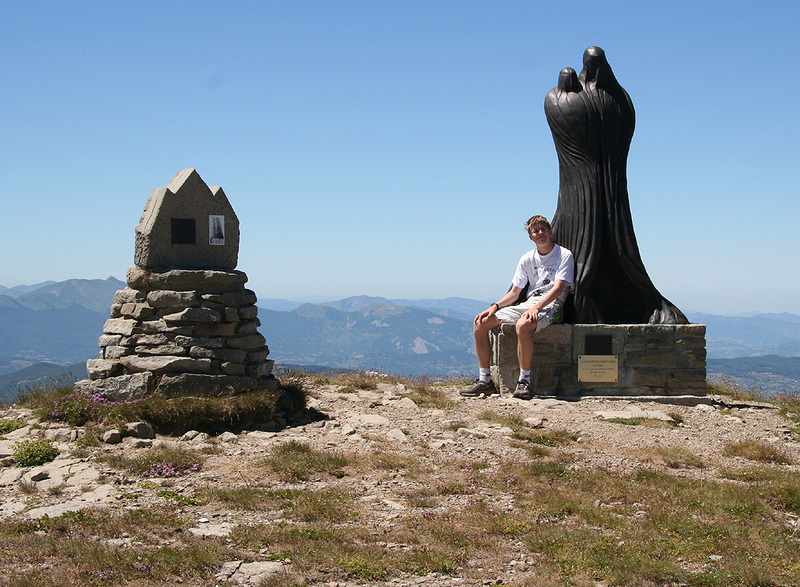 There is a nice sculpture marking the Cimone HP. In order to make this trip really nice, and enjoy the good views and weather a bit extra, we traversed across and descended more south along trail number 447. This trail descends to a main col at elevation 1817 meter before ascending the next mountain. Right here is a trail fork, and you can turn right and follow trail number 489 directly back to the trailhead. Note that a somewhat longer route is also possible, but this would require more sophisticated logistics. (One member of the party picking up, or have a car left, in Abetone.) 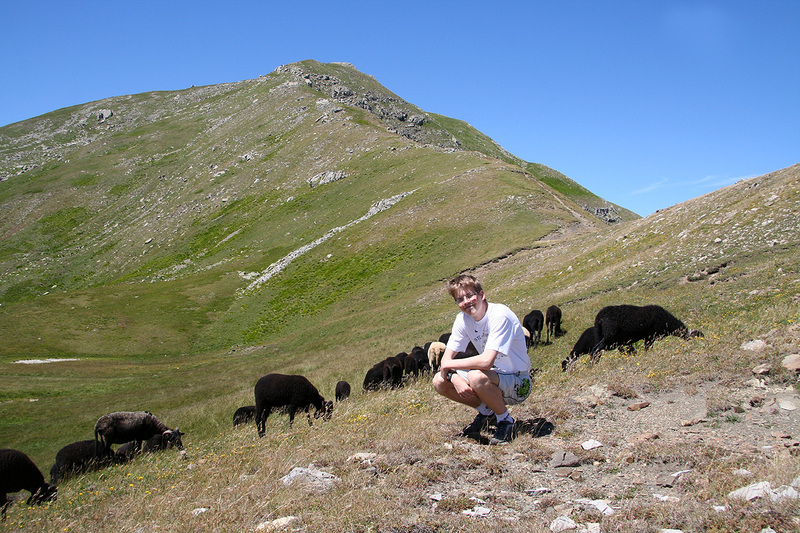 Instead of forking right in the col, one may continue across the summits further south in the direction towards the town of Abetone. 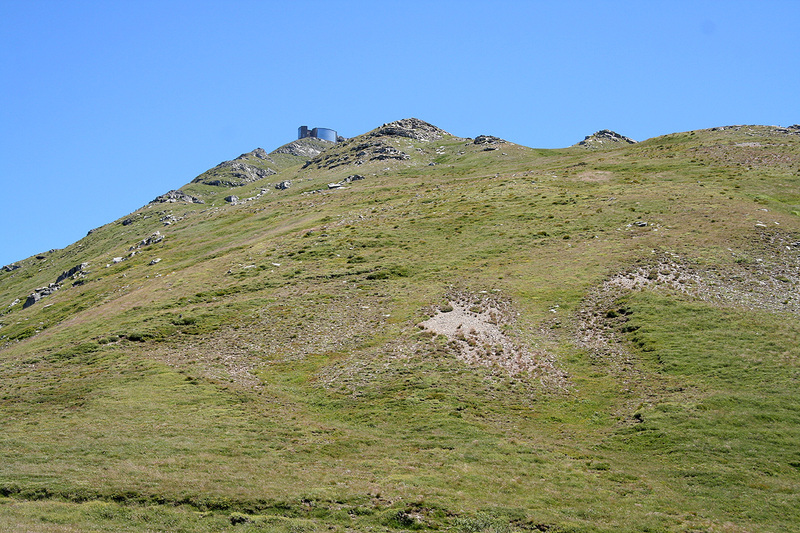 This ridgewalk looks very nice, you first ascend Monte Lagoni (1952m), then traverse the ridge to Libro Aperto, (Rotondo), at 1936 meter. This section continues to follow trail number 447. 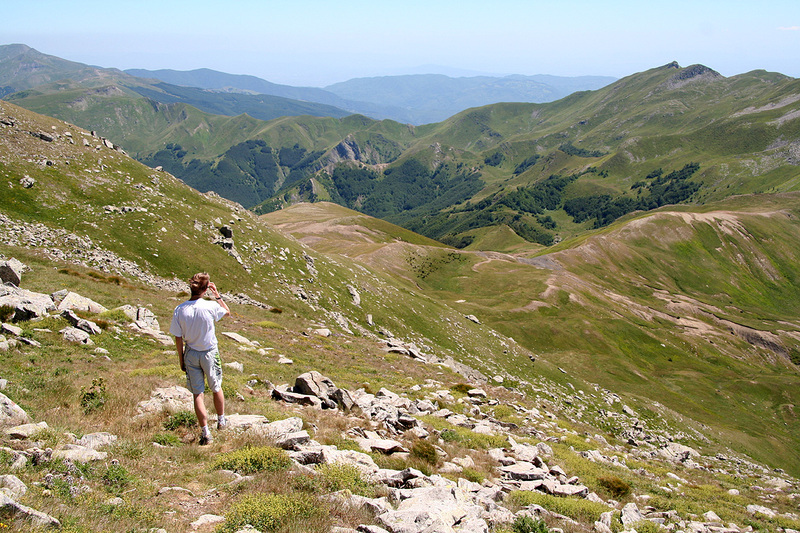 From Rotondo, the route would turn more west as you follow trail number 00, descending to the town of Abetone. Comments: Heidi, Pål Jørgen and I started out around 1240, after a nice morning drive from Parma (where we stayed in our favorite Hotel Button the previous night.) We hiked at a leisuring pace up the road to the main north-west ridge where we had lunch, 1345-1400. At this point we split up, Heidi hiking below the west face in a loop back to the trailhead, while Pål Jørgen and I headed straight up the ridge to the summit. The summit was reached at 1430. 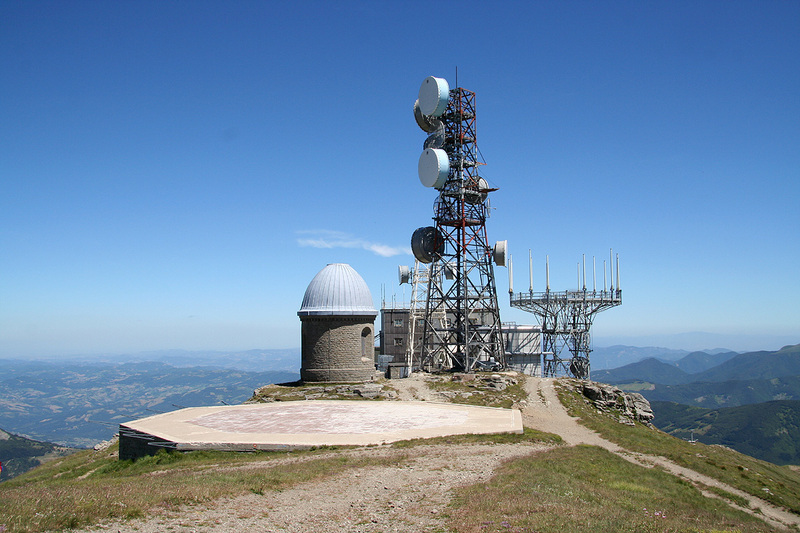 Despite all the antennas on top, I was pleased to see that the highest point was left untouched and that it indeed had a rather nice summit sculpture. We rested and took photos, then traversed the top and headed down south, following trail number 447. At the main col, just before trail 447 climbs the next mountain, we forked right on trail number 489 and followed this trail directly back to the trailhead where Heidi was waiting. We were all at the car at 1545. We drove back down to Fiumalbo and got a room in the nice, traditional hotel (3 stars) located in the middle of town. The next morning, we started out for a reserved hotel in Alassio, on the Italian Riviera. We would stay there 3 nights, while Pål Jørgen and I would make a two-day assault on the very prominent and quite famous Monte Viso. 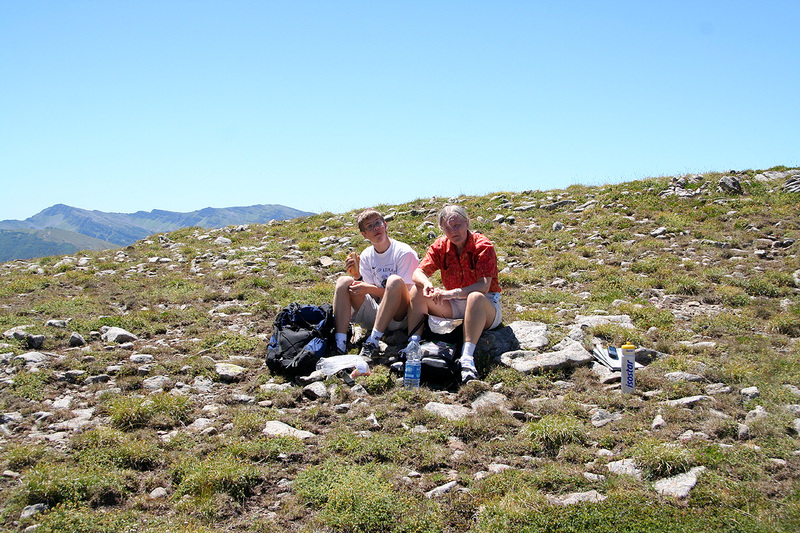 We have lunch on the ridge at 1800 meter. The last part of the summit ridge. The summit, Pål Jørgen and a nice summit monument. Descent in nice terrain,Pål Jørgen. Pål Jørgen, trying to contact the locals.